A number I don't recognise is ringing my phone. Unfortunately, I think I know who this is. I answer. "Hello, daddy. It's break time." "Didn't we say that you weren't going to use your watch at school?" I have roped my family, and our neighbour's family, into testing out some wearable for kids. While the 10-year-old girl next door is managing to keep schtum about the Tinitell device around her wrist, my 7-year-old son is all too excited about his his new smartwatch. Mobile phones are not allowed at school - at least not at their Hackney primary - but, as Banksy recently said, it's easier to ask forgiveness than it is to get permission. Our scheme was to put three of the first wave of children's wearables through their paces and to try to discover whether these kinds of devices are actually worth using. We've chosen the flashy, sleek but screenless Tinitell; the touchscreen, step-tracking Omate Wherecom K3 and TechSixtyFour's The Gator which is a UK-refined version of a popular device manufactured in China. Here's what the parents and the kids made of it all. Even in setup we learned two very important lessons. The first is that kids remember everything. We were a little concerned that these devices might be a bit complicated for them. We were wrong. The Gator has four buttons that do different things depending on how long you press them for and appeared to be the most tricky to master but never once did either of the kids in question have a problem nor even did they need a second lesson on how the watches work. They were keen, they were interested, these device felt like a fun treat and they were hooked from the start. Good news. They even found features that the parents hadn't discovered yet which brings us onto the second lesson. 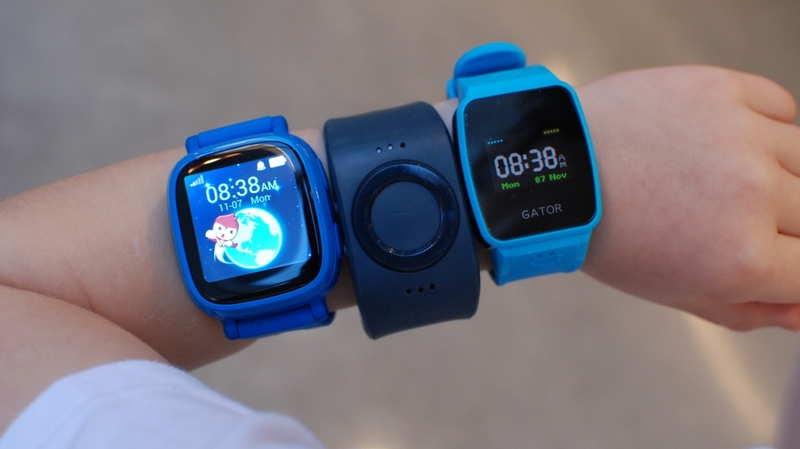 Children's wearables are very much at the early adopter stage of the tech life cycle at the moment and, as such, there are teething problems even with these supposedly easy installations. There's a fair bit of registering SIMs, Bluetooth connecting and manual phone number insertion to be done with the apps, the most straightforward of which was Tinitell. Even then, there were some problems getting phone calling to work or fixing issues when the GPS didn't seem to be responding. Now, as a tech journalist, I didn't find this anything out of the ordinary. For my neighbours, though, it took a fair bit of coaxing along through the problems. Without me pushing them, they would have lost interest fairly rapidly and one can imagine a lot of these things getting returned to the shops after a quick 15-minute trial - a lesson for both the manufacturers and those looking to buy one at the time of writing. Let's get one thing straight first. These are not kid trackers. They all have GPS and each of the accompanying mobile apps will display your child's location on a map but this is not their primary function. They are marketed and sold as communication devices. They are wrist-worn mobile phones for children and it's by far and away the job that they do best. You can white list which numbers can ring in and who they can call using the apps, meaning that you don't have to worry about bad types getting hold of their number. All the watches require a SIM and, therefore, a certain constant upkeep in cash. The Tinitell and the Omate leave it up to you, so we went down to Tesco and picked up a couple of PAYG cards which managed to last the weeks that we used them without having to top up any more than the initial tenner. Gator is the only one that differs and, although potentially more expensive, it makes it more reliable. Gator offers service plans for £9 or £11 per month depending on whether you're happy with a 12 month contract or the convenience of a 1-month rolling version. For that you get 60 minutes of call time and all the data that the device could need. That sounds pricey but the deal is that it's a multi-network plan meaning that the watch will log onto whichever signal is strongest from either O2, Vodafone or EE. You can also use any of those minutes for free if you're on holiday in an EU country too. After a one or two issues getting a signal with the other devices, we felt that this multi-network strategy was the way to go. In practice, the two-way conversations between parents' phones and kids' watches was a real success. Everyone managed to work out how to make and receive calls, the quality was very decent all round and there were a lot of good uses cases - sleep overs, getting picked up early from after school classes, calling in for dinner from the local park and even the simple sense of security that it gives your child knowing that they can get hold of you when they need to. Most of the time, they don't bother but it makes them a lot less anxious going on play dates or heading happily into less familiar situations. Probably the only downside was getting a lot of prank calls from my son. We're still waiting for the novelty to wear off. The GPS smarts of these watches were rather varied. The technology is pretty decent. They use the GPS when outside and Wi-Fi triangulation when indoors. They also don't go into GPS mode until the watch is in motion which helped to save on battery life. The Tinitell reckoned it was accurate to within a metre. The Gator was confident enough to offer geo-fencing features where you could set up a number of different perimeters that sent alerts to your phone when they were broken by your child. So, you could have one labelled 'Home', one for 'School' and one for, say, 'Park', or 'Football Class' or such. For our money, though, none of the tracking on any of the devices was really reliable enough to bother using geo-fences or to provide much parental comfort either. We tried a lot of hide and seek around our local park and most of the time the watches didn't offer much of an edge in finding the kids. It's a shame because our neighbours were particularly interested in the GPS features given that their daughter is beginning to walk to school on her own. They found the information too hit and miss to be of use. Once they stopped trusting the system, it ceased to be of value to them. Ultimately, though, as we say, tracking is not what these wearables are sold on partly because it can be flakey but mainly because tracking does not keep your child safe. All you really know is where the watch is. There's nothing to stop anything bad happening to the child nor anything to stop a kidnapper taking the watch off and throwing it away. Short of getting your kid microchipped, there's not any junior wearable that's going to offer such protection with an real confidence. What children want from a wearable is very different to what the parents think is a good idea, we quickly discovered. Given the choice of three to wear, my son was interested in the one with the touchscreen because, to him, that was fancier, even if the Omate was probably the least effective from my point of view. The other reason he liked it was because it doubled as an activity tracker and he enjoyed trying to cheat it by swinging his arm around or actually running up and down for a while to hit his target. To be fair, this isn't all that different to some adult behaviour with the same kinds of devices. Again, though, we're still waiting for the novelty to wear off. Naturally, one of his early questions was over which one had any games on it. Fortunately, none of them do. PRO TIP: avoid any kids wearable with games on it like the plague unless you have no problem with your child constantly screening its little face off. Style-wise, there weren't any real clashes. We were expecting some resistance over grounds of fashion, particularly when it came to our 10-year-old neighbour, but none materialised. The Tinitell was considered something of a looker but there were no rejections. The only other design issue of note is that these watches are actually quite big on child wrists and they can be uncomfortable to wear over the course of the day. There were quite a few occasions where my son simply wasn't up for it and that was frustrating for those situations where we knew that having two-way communication would be really useful. He wanted to take it to school every day - presumably to look cool - but wasn't that interested when we went out to a fireworks display where losing him in a crowd at night might be a real issue. There's not really anything you can do about that part from bribery and that's not a method that's going to have much longevity. These devices are aimed at 6-10-year-olds as their sweet spot and it was pretty clear, pretty quickly that my neighbours, who had been dead keen on the promise of these wearables, lost interest as soon as they saw that they weren't 100 percent reliable and that's understandable. Our family was happier to stick with the program but even us - who are pretty used to trying out all sorts of smart kit together - are struggling to see that they make much difference to our lives. The best way to consider these wearables is as mobile phones that are much harder to break and lose than ones that you put in your pocket. They're good for a couple of tween years but it's only really a matter of time before they'll want a proper smartphone. They do genuinely offer some good moments of communication but not so many that we felt they were worth the cost and the battery charging. They didn't really change the way that we parent. They didn't makes us any more relaxed when our kids were out of sight. There will be an age where they do, where they become a tool by which we can extend our mutual trust and our children's wanderings but, even then, we get the feeling that wearables are a way of getting used to it rather than a permanent solution. There's no device that can encourage a parent or a child to increase their separation. That has to come from your relationship, but, at the least, watches like these perhaps do have a place in the transition.